All in all, I found the experience of attending and participating in an event to record and report on it good fun and a bit odd. 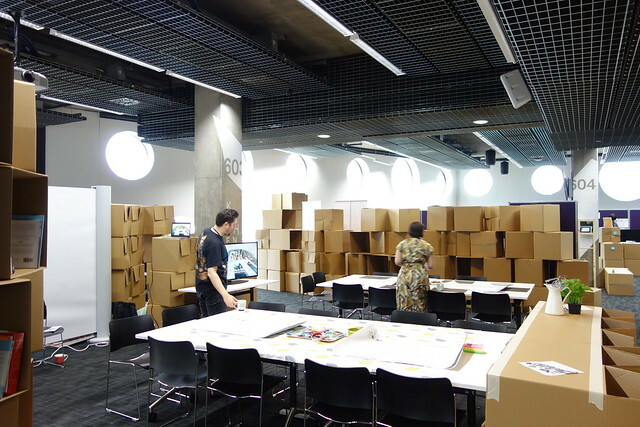 I participated in a couple of the workshops on the Saturday, and listened to what I think was the best session on Sunday – a panel with an architect, a professor and a designer discussing kitchen design and its place in constructing female reality. 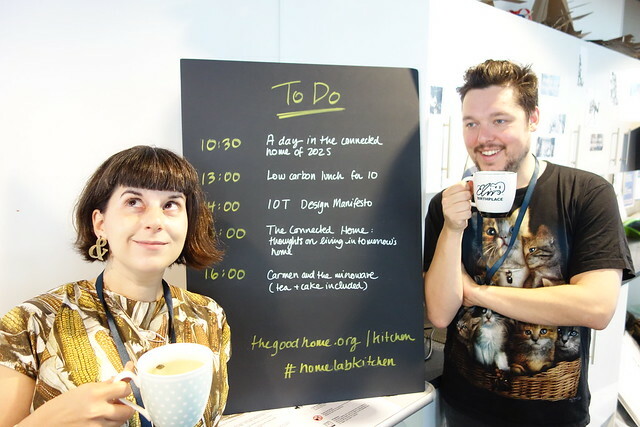 It was especially clear from a couple of the workshops that what’s technically possible with an arduino, a pliable api and a willing participant is often a long way from the reality of the kitchen as a space. The kitchens I know and love are often a bit of a mess, full of steam and delicious smells, covered in dishes at their cooking heights, and perhaps most importantly, where people congregate, especially at parties. Yet the kitchens we see in work like Corning’s A Day Made of Glass shows a pristine environment that evokes a similar sense as a building that’s designed to never be lived in. The glass/chrome/clean/clinical tech thing just doesn’t gel with a real kitchen. For me, at least. It was here that I invoked the power of Julia Child, as my talisman of woman expert, a powerful cook, and fully in charge of her domain. I drew upon her kitchen design, now part of the Smithsonian’s collection, as a direct and deliberate design made literally just to fit her. The distance from there to a day made of glass is great. 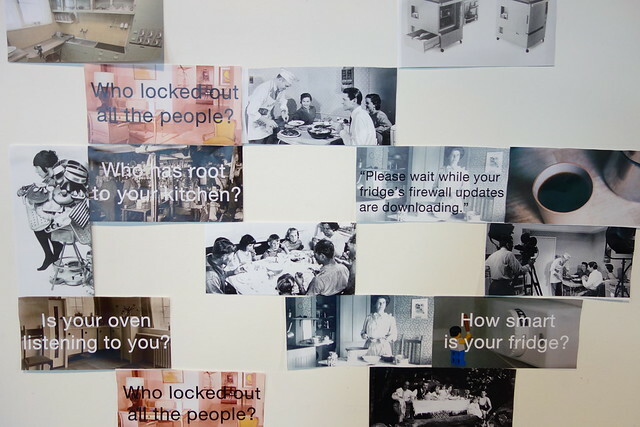 Anab Jain, a designer and panellist on day two, suggested to the group that we need to look across cultures and families to understand the flow and rhythms of a kitchen and design for it accordingly. She spoke of the dearth of communal food preparation, and its replacement by fast food and isolation. It also struck me that this XYZ vs. Reality theme is echoed in the work we did at The Small Museum V1, on our day working with Nandi, the lonely steed of Shiva. We made an installation to try to reveal how Nandi lives in the real world (surrounded by people, food, smoke, prayers, colour, flowers, food), and contrast that with his position in the British Museum, in a stark cold blue room off The Great Court. I knew as soon as Alex approached me that I wanted to incorporate kitchen infomercials somehow. You know the ones, where women are struggling at the start of the commercial with some simple or mundane task like putting utensils away, only to be saved by characters like Chef Tony and his amazing widget. 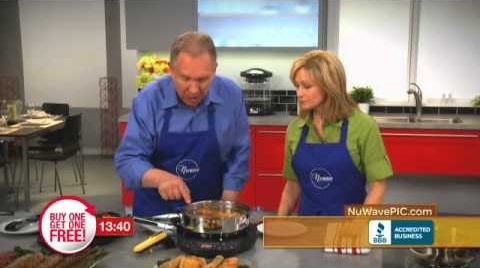 Every infomerical I watched has a woman “host” quite passively listening to a male chef or other saviour who’s here to rescue here from her inability to operate her kitchen. 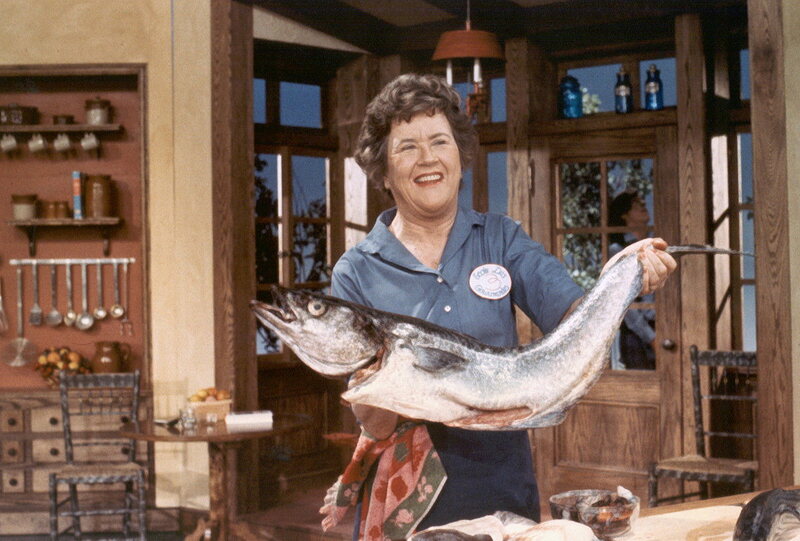 Julia Child’s strength and excellence was also a useful contrast to this dynamic, and I found this excellent picture of her holding a huge fish and smiling. There’s a lot more to this than just that. This idea that women are often the audience to technological wizardry bears further thought. Along with Alexandra, the event was hosted by Peter Bihr and we were also joined by Marcel and Harm from The Incredible Machine, who co-wrote the new IoT Design Manifesto. 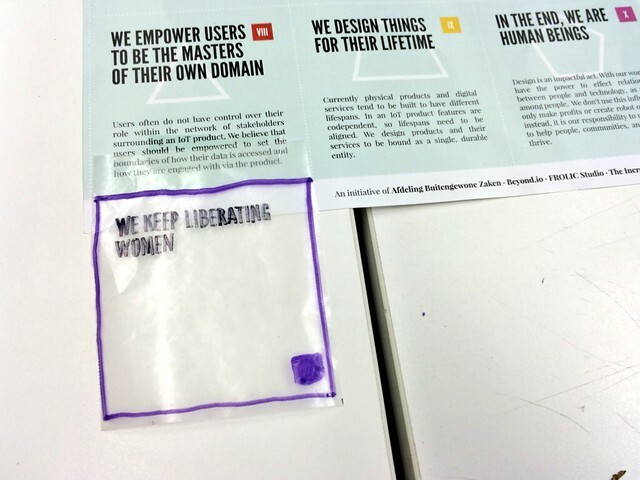 The museum more or less culminated in a point of view, which was to suggest one addition to the manifesto, given the thinking and absorbing of the ethically centered conversations from the previous two days: to keep liberating women as we continue to develop IoT and other technologies. Upon reflection, making this last minute museum was a lot like the early stages of designing something. It was a bunch of listening and collecting, and then re-presenting what I’d heard synthesised into some strong concepts. Roll on, V3!